Twice a year, we host an "Auction Week" in which members can SELL! This week is IT! 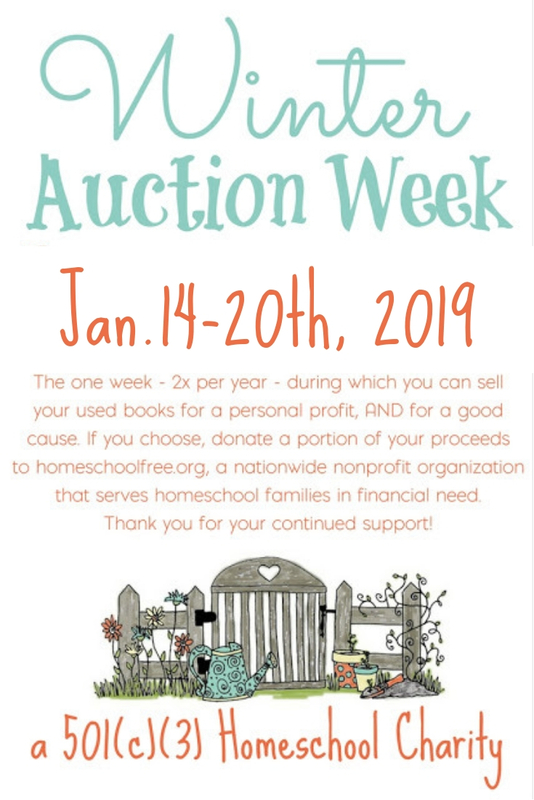 Go sell your used curriculum, and help homeschool families in need at the same time! Winter Auction Week is the week of Monday, January 14th through Sunday, January 20th. Money Simulation Event Announced - for Kids and Parents! Hey, homeschool parents! Does your child need to learn money management skills? Then you won't want to miss this free event! We’re shaking things up in the Facebook group with something we’ve never offered before. On Wednesday, February 28th at 7:30 pm EST, we’re handing the mic over to Amanda L. Grossman of MoneyProdigy.com to deliver her FREE Mt. Everest Money Simulation program via Facebook LIVE. Winter Auction Week is coming up soon! Our AUCTION WEEKS (July and January) are always a fun event. We do them twice a year, once at the end of each "semester" - as folks are switching gears and perhaps needing to get rid of curriculum. So, we are planning an upcoming Winter Auction Week, and we're letting you know about it ahead of time so you'll be prepared! We as a community of homeschoolers are working together to help Hurricane Harvey and Irma victims who have lost their books and curriculum. As families begin to get their lives back together after the devastation, we are organizing an effort for anyone, anywhere, to help, right from their own homes. Here's how you can help! Please consider donating your extra/unused curriculum and support to homeschool families to help them replace what was lost and get back on track with their home education. Hurricane Harvey victims are homeschool families too. Many of them have lost their books and curriculum, and we can help! 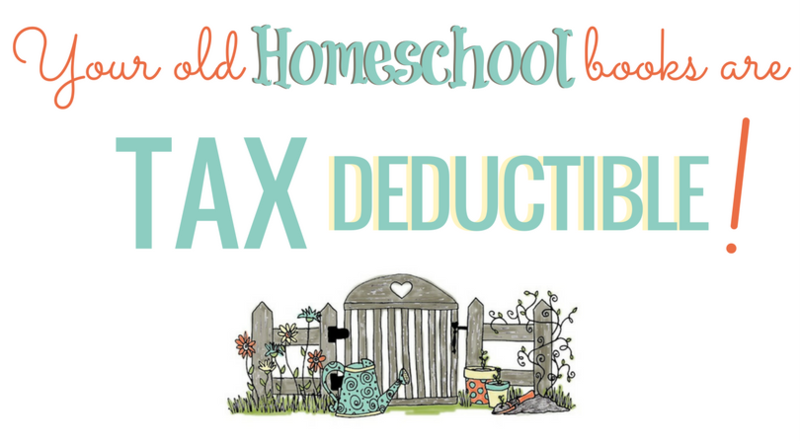 Please consider donating your extra/unused curriculum and support to homeschool families to help them replace what was lost and get back on track with their home education. Homeschool Curriculum Free for Shipping is a 501(c)(3) charity helping over 13,000 homeschool families across the United States. Your donations are tax-deductible. Announcing the recipient of Unveiling Glory's homeschool Bible curriculum donation, Cat and Dog Theology. Recipients of the School Supplies Donations! Announcing the recipients of the (possibly annual?) HSCFFS school supplies donations for homeschool families in need! 20th donation: BACK TO HOMESCHOOL! Donors at Homeschool Curriculum Free for Shipping are offering school supplies they've collected for fellow families in need. How to apply is detailed below! Unveiling Glory has a wonderful homeschool Bible curriculum for kids, Cat and Dog Theology, and is donating one kit for one homeschooling family in need. Announcing the recipient of the $100 Educents donation. A very special curriculum resource is available to homeschool parents that would not normally be able to afford it (this summer only - ends August 31st, 2016). FYI: Get Ready for Auction Week! An anonymous donor provides Life of Fred, Story of the World, and games for Math for two homeschool families in financial need. Donation #15: What D'Ya Need? This is going to be a fun one! One donor wants to provide some specific curriculum items for some homeschool families in need. You say what you're most in need of, and if it's what she wants to give away - it's yours! Announcing the winner of Homeschool Manager - The Easy Online Planner. One family in need is receiving a free subscription!